Step 1 In a small saucepan, heat one-half cup of the cream with the chopped laurel to a simmer. Turn off the heat and steep for 30 minutes. Return the mixture to the heat. Add the remaining one-half cup cream and bring to a light boil, then remove from heat. Strain out the leaves and discard. Step 2 Pour the cream over the chopped chocolate. Let the mixture stand for 5 minutes. Whisk to melt the chocolate, then whisk in the butter, one piece at a time, until smooth. Step 3Pour into an 8-inch springform pan and use a spatula to smooth the top. Allow to cool slightly at room temperature, then cover and refrigerate until firm, about 30 minutes. In Recipes-list.com we have selected the most viewed recipes from category - Desserts . Enjoy the best recipes specially selected for you! 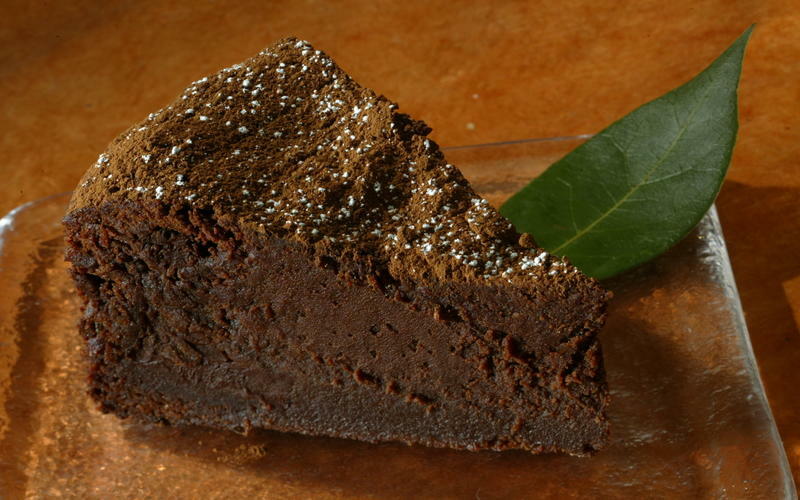 Chocolate cake with bay laurel is the right choice that will satisfy all your claims.